RNOR (Resident But Not Ordinarily Resident) is not very well know even in NRI circles. A few days back when I wrote a post about “status of NRE FD after return to India“ – I got few emails & comments that they have not heard about this. Surprisingly even bankers don’t provide this information to NRI returning to India after the long stay. This increase tax liability of NRIs which he would have saved legally. So I thought to cover this in detail including RNOR India tax & also added a calculator. He/She has NOT been a resident in at least 2 out of the last 10 years. 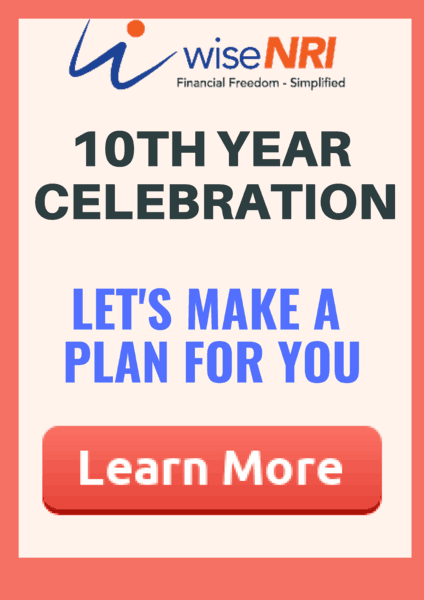 If the NRI has been outside of India for 9 out of the last 10 years, he can be an RNOR for 1 year. If the NRI has been in India for a period of 729 days or less during the last 7 financial years, he can be an RNOR for 3 years. Let us make this simple with an example. Ms. Shweta left for the United States in 2001. She returned to India in June 30th, 2017. She will be considered as an RNOR for the financial year April 2017-March 2018. She has been in India from June 30th, 2017 to March 31st 2019. That is a total of 639 days which is less than 729. Therefore she will be treated as an RNOR in the financial year 2018-19. By March 31st, 2020, she would have been in India for 1005 days and therefore she will be treated as a resident Indian for the financial year 2019-2020. I don’t think after this explanation any calculator is required but if you still want you can download this simple calculator. The government gives certain benefits to returning NRIs by making them as RNOR for some time. 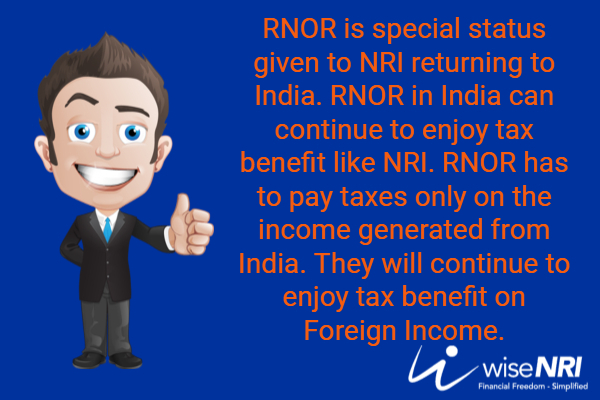 From a taxation perspective, an RNOR will have a similar status as that of an NRI. 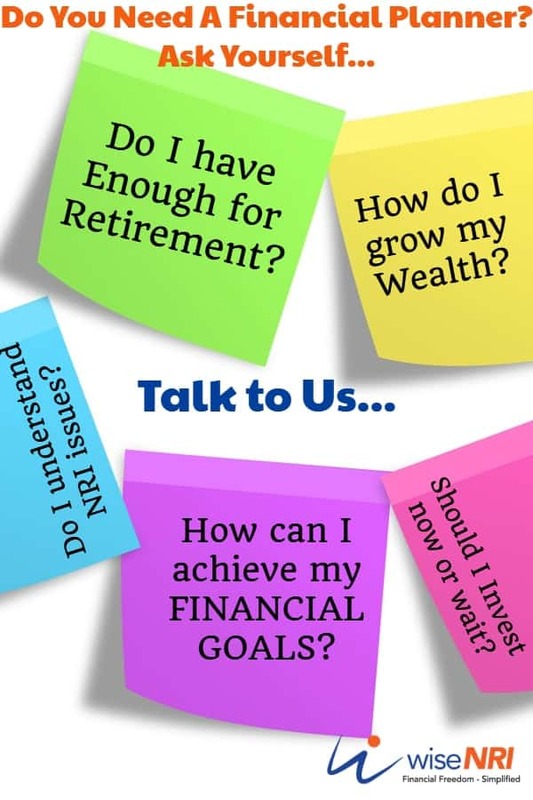 Why do NRIs get the RNOR Status? Interest on FCNR deposits and NRE deposits till their maturity. You cannot renew them. Once the NRI becomes a Resident Indian from an RNOR, all income whether earned in India or abroad is taxable unless concessions and exemptions granted under the Double Taxation Avoidance Agreement, if any, between India and the previously residing country, are applicable. If your status gets converted to Resident Indian, inform the bank so that your bank accounts (NRE and NRO) are designated as resident bank accounts. Your investment accounts should also be converted to resident accounts. The deposit accounts in NRE and FCNR accounts can be continued till maturity, transferred to Resident Foreign currency accounts or closed down. Any income received overseas becomes taxable based on Once your status changes to Resident, all your overseas income becomes taxable. Also, you have to intimate your bank about the changed residency status and convert the existing NRI specific accounts to resident rupee accounts. Q.1 I was an NRI for the last 8 years and returned to India for good in October 2018. I have invested in a residential property in Hong Kong where I was residing earlier. I have rented it out and get rental income on it. Should I pay tax for it in India? Ans. Since you have returned only in October 2018, you have stayed for less than two months in India which means you are an RNOR. The rental income will not be taxable in India for now. Q.2 Anish went to United States to work in January 2018. For the financial year 2017-18, what status should he use to file the income tax returns? Ans. Since Anish has stayed less than 182 days in US for the financial year – 2017-18, he should file the income tax returns as a Resident Indian for the financial year 2017-18. Q.3 Do I have Indian citizenship when I have the status – not ordinarily resident Indian? Ans. Yes, a person with RNOR status has an Indian passport and therefore is an Indian citizen. Q.4 Can I get an RNOR status more than once? Ans. You can get an RNOR status more than once provided you fulfill the conditions that give a person the RNOR status. What is an RFC account? An RFC account or Resident Foreign Currency account can be opened by a person who has the status – RNOR. Foreign funds can be brought to India in any currency you wish to and can be deposited in this account. NRE/NRO/FCNR savings accounts and fixed deposits can be converted to RFC accounts and RFC fixed deposits. Any interest that you earn in the RFC account while you have the RNOR status is tax-free in India. It is useful as you need not to bear the effort and cost of currency conversion. It is easy to transfer these funds abroad if you move to a foreign location again. I know RNOR is a complex topic – I have tried my best to simplify this. If you still have any questions on Resident but non ordinary resident Indian status – please add in the comment section. Please also share your experiences. If a person returns back to India in Oct-18, he will be NRI in FY18-19 (less than 182 days stay in India). Does he have to inform the banks immediately or in April-19. If he informs the banks immediately, his NRE FDs will be converted to resident FDs and banks would start deducting TDS with immediate effect. Can he avoid TDS by banks in FY18-19? RBI has not defined the term “immediately upon the return of the account holder to India” but it should be taken in its normal sense which can mean a few days or at the most a few weeks after returning to India. As far as taxability of the interest is concerned the tax exemption would continue only for the years that he was a “resident outside India” as per Foreign Exchange Management Act (Fema). For the FY 18-19, you are treated as NRI as your stay in India is for less than 182 days. Interest on NRE FDs would remain exempt for 18-19 financial year. Informing bank about your permanent return is not a criteria for your taxability, taxability arises according to your residential status. What about persons of Indian Origin having OCI card who have accepted foreign citizenship and desire to come and stay in India. As an OCI when you return to India, you will automatically be RNOR. And you will not be liable to any taxes in India on your global income. I can rate this a very good and rare article as no one else ever covered this topic. I have been in touch with my RMs from largest private banks of India, who are in regular touch with me for investments. I have queried them many a times about the same subject how our long time earnings from abroad and NRE deposits will be treated after I return to India. But never I received any info about RNOR or RFC. But above article is really self explanatory and will surely serve financial planning of those who return to India. I am regular reader of your articles since 2010, I suppose. Thank you for the insights. I claim RNOR status but my current foreign employer wants to retain me and continues to deposit salary during the period. I don’t resign but my employer gives the facility to work from India while the salary continues to be paid in foreign account. In this case, will this income be taxable ? Should I declare this ? I will suggest you have a word with CA – DTAA. My understanding is if it’s not taxed in a foreign country – it will be taxed in India. I am currently an NRE for past 20 years. Now I am planning to return to India permanently. Can I get RNOR status after my return to India? Yes – you will get RNOR status. For some one who has been been in US from 2008 and planning to return June 2018, for year year April 2018 to March 2019 – RNOR, April 2019 to march 2020- RNOR and for April 2020 to March 2021 – Ordinary resident. Yes you are right,as mentioned above in article, interest on FCNR deposit and NRE deposit is tax free if you hold it till maturity and your status is RNOR.But in such status you can’t renew them. So there is parity between two in terms of taxation of interest in RNOR status. If NRI rturn to india before completion of 5 years what woudbe status of NRE accounts . You can easily check your status with the help of chart given above. If your status is RNOR, you can enjoy tax-free interest on NRE FD. Status of NRE account changes once you become resident.